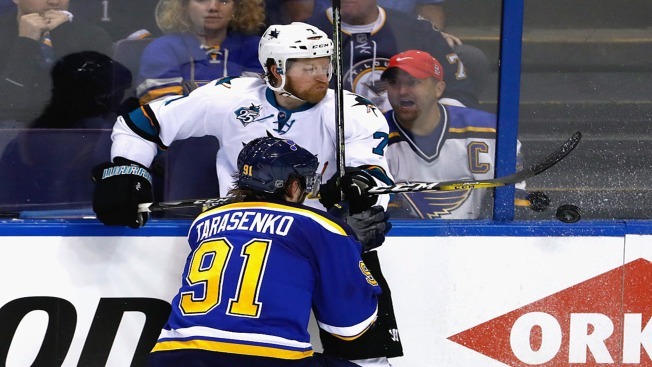 Vladimir Tarasenko #91 of the St. Louis Blues and Paul Martin #7 of the San Jose Sharks battle for the puck along the boards during the second period in Game One of the Western Conference Final during the 2016 NHL Stanley Cup Playoffs at Scottrade Center on May 15, 2016 in St Louis, Missouri. ST. LOUIS -– The Sharks and Blues both had the right to feel confident about their games heading into Sunday’s Western Conference Finals opener, as they were each coming off dominant Game 7 performances in the previous round. The Blues are the only ones still feeling good, though, beating the Sharks at Scottrade Center 2-1 to take the early lead in the best-of-seven series. Game 2 is on Tuesday. Jori Lehtera’s goal in the middle of the second period was the difference, and was a preventable goal on a number of fronts. Brent Burns turned the puck over to the Blues center in the neutral zone and then backed off of Lehtera, who charged into the zone. The shot from the circle was a stoppable one, too, but it deflected off Martin Jones' arm and into the net at 9:15. Blues goalie Brian Elliott preserved the lead the rest of the way, making his best stop of the night with a right pad on Joe Pavelski’s one-timer about one minute later. Elliott got help later in the second period, when he was unable to freeze a slow moving puck that was sliding in his direction, but the whistle blew before the goalie inadvertently kicked it over the line. A Marc-Edouard Vlasic wrist shot with two-and-a-half minutes left in regulation smacked Elliott’s blocker, and the goalie covered it up in a maze of bodies after briefly losing track of it. He got just enough of a Pavelski chance from the slot with less than two minutes left, after Jones was pulled for an extra San Jose attacker. San Jose has lost its last four road games, including all three to Nashville in the second round. The Sharks are 4-11 all-time when losing the first game of a playoff series. St. Louis scored first. After getting a goal overturned due to incidental contact with Jones, the Blues took the lead anyway when David Backes got his stick on a Kevin Shattenkirk blast at 15:04. San Jose tied it just 34 seconds later on an impressive shift by the top line. Pavelski got a piece of a Burns offering that deflected again off Tomas Hertl, whose nice work along the wall earlier in the shift kept the Sharks in possession in the offensive zone. It was Hertl’s third goal of the playoffs. The Sharks had a distinct territorial advantage in the second period, outshooting the Blues 17-5, but St. Louis took a 2-1 lead to the dressing room on Lehtera’s slapper. Entering with a lethal power play that was operating at 31.0 percent in the playoffs, the Sharks went 0-for-3, including one third period advantage where coach Pete DeBoer used his timeout to keep his top unit on the ice for the duration. The Blues owned the third-ranked penalty kill in the regular season, while the Sharks had the third-ranked power play. The Blues went 1-for-2, capitalizing on Logan Couture’s trip of Robby Fabbri, his first penalty of the playoffs. Jones and Elliott have started every game in the playoffs for their respective teams. Jones allowed two goals on 23 shots, falling to 8-5 in the playoffs, while Elliott made 31 saves to improve to 9-6. The Sharks made no changes to their lineup from Thursday’s Game 7 clincher against the Predators. An injured Matt Nieto, out since Game 6 of the second round, is expected to be available at some point in the series, DeBoer said. Healthy scratches for the Blues included Ryan Reaves, Magnus Paajarvi and Dmitrij Jaskin. Vlasic’s five-game point streak (6 assists) came to an end. The Sharks will remain in St. Louis as they prepare for Tuesday’s Game 2 (5 p.m., NBCSN). San Jose is 15-18 all-time in Game 2s, but have won both this season. The series continues every other day, with Game 3 on Thursday and Game 4 on Saturday, both in San Jose.